Next General Elections In India are going to take place In May 2014 after 5 years. Rahul Gandhi is congress's candidate for Prime Minister while for BJP Narendra Modi is Candidate for PM. 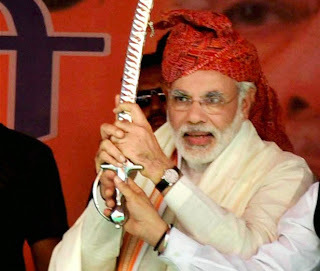 Different political experts are declaring Hindu Extremist leader Narendra Modi favourite for winning the coming elections. For those who don't know Narendra Modi is the same person who was directly Involved In Mass Killings of Muslims In Gujrat In 2002 as Chief Minister of Gujrat and now he is candidate for the next PM. This shows the dangerous situation for the Indian Muslims. Indian Muslims has faced massacre again and again by Hindu Extremists over the past few decades. Gujrat riots, Babri Masjid are two big examples of It when thousands of Muslims were killed and many Muslim women were raped. Hindu Extremist groups Like BJP and RSS always played politics on communal basis. they also came into power for 5 years in 90s and now it seems like they are going to come in power once again. India claims to be a secular country but the way minorities specially Muslims are treated In India tells a different story. there is no minority In India which has not faced massacre. Sikh community faced massacre in 1984 and after it. Christian community faced massacre In Orissa in 2008. Muslims community has faced uncountable massacres Including Babri Masjid and Gujrat riots. the most recent attacks on Muslims taken place in Muzaffarnagar a city near Indian capital Delhi.